removing your cooked meats from the smoker. These cuts are large, oddly shaped, covered in rendering fat, and too hot to handle bare handed. They are typically too big to handle with typical grilling utensils. Oven mitts aren't a good option because they will be soiled and they don't provide protection against hot liquids that can spill. In the past, I used silicone gloves that are lined with cloth like these. They cost about $14 online. 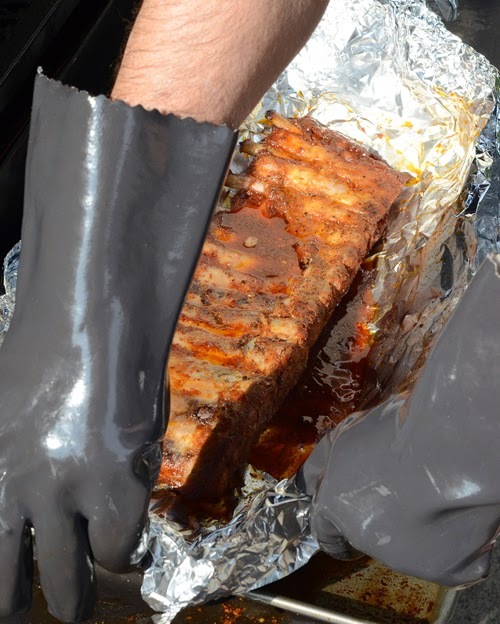 Removing hot spare ribs from the foil pack. They were good at handling the meat safely but the cloth lining made sanitation and maintenance a bit difficult because if the insides got wet, they take forever to air dry. If you put them away with them not fully dry, you end up with mildew and other contamination in the gloves. 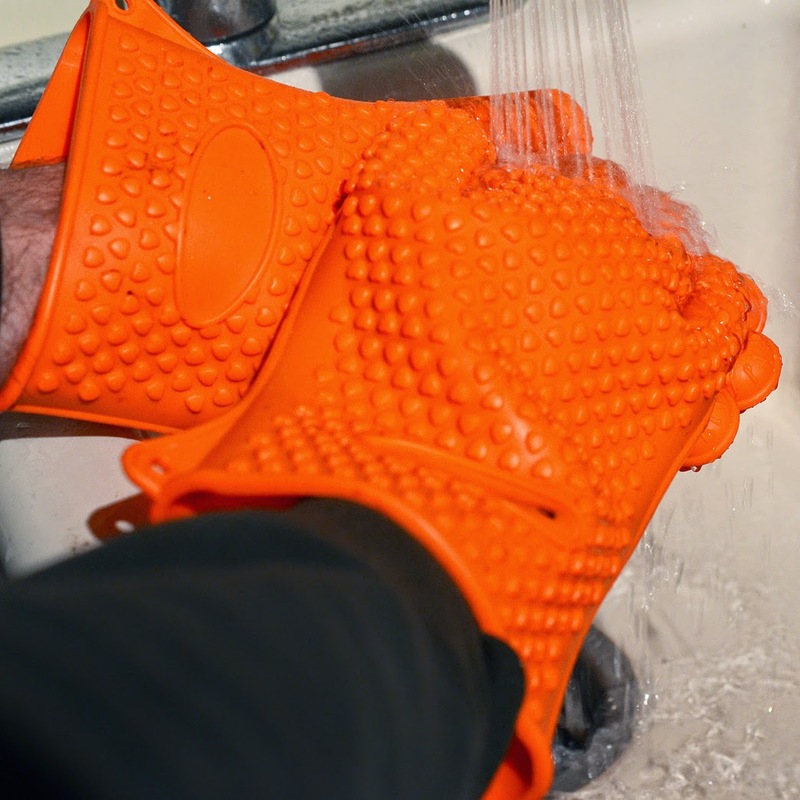 Then I saw these bright orange silicone gloves and thought that they might be the answer. Ekogrips are available for $26.27 a pair via Amazon, which is where Alexis bought ours. I have used them for one year now so thought I'd do a review. I have used this pair for a full year now and they have held up well to the use and washing. Make it very easy to handle the large cuts of meat on the grill. Heat resistant to 425°F so they are rated way more than any food you will be handling. The outer surface texture makes it easy to handle the greasiest cuts of food without slipping. They are super easy to clean, just wash your hands with soap and hot water while wearing them. The insides are silicone too so even if they get wet, they will dry more quickly and don't give pathogens a place to hide and grow. They are also dishwasher safe if you want to go that route. They are resistant to grease, heat, and hot liquids. They hold up well to repeated use. The ones pictured are the actual ones I have used for 1 year. They aren't great for handling hot grill parts, which can easily exceed their 425°F limit. 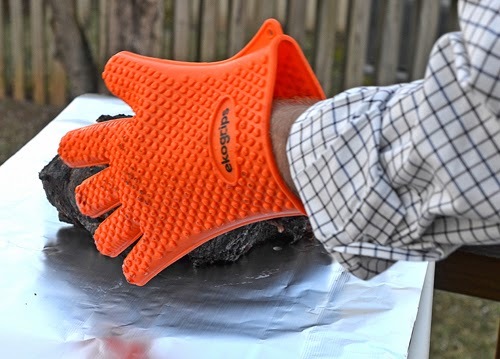 I moved a standard BGE grate while wearing a pair of these at the Taste of Atlanta and got a 2nd degree burn on my right middle finger without even damaging the glove. The heat just passed right on through. 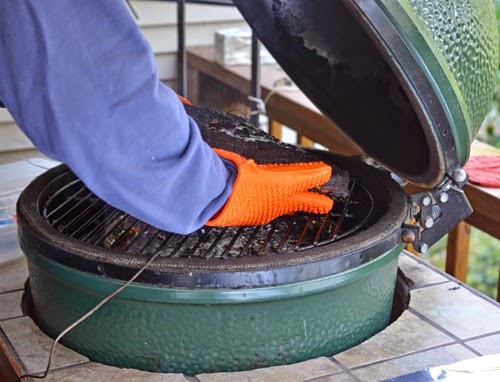 Best bet is still a pair of leather welding gloves for handling hot grill parts. They aren't the best when it comes to dexterity, the fingers can be awkwardly stiff. You won't have fine manipulation ability while wearing them but they are good for handling the big cuts. Greasy silicone is slippery. They can be quite difficult to get them off once they get greasy, you don't want to wear a tight fitting pair when you are home alone. Not too big of a deal, I just lightly bite the tip of the middle finger and pull the glove off with my teeth. Handling a hot beef brisket on the Big Green Egg. Handling smoked pork butts this past weekend. Just wash with soap and hot water like you are washing your hands or use a dish brush. 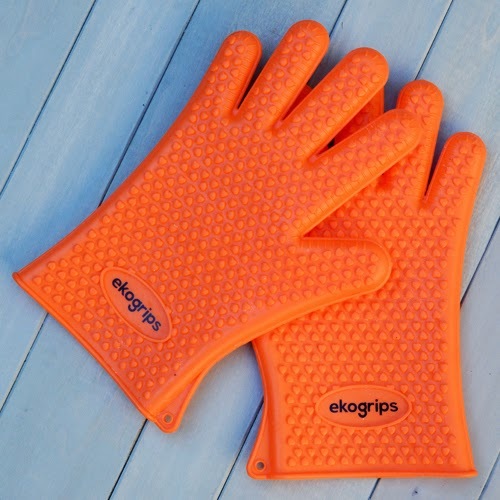 Ekogrip Silicone BBQ Gloves are the best option that I have found for handling hot turkeys, ribs, briskets, butts, and roasts. They handle the heat and grease without batting an eye. Gator Gloves and a few manufacturers make similar gloves for a bit less but I have not tested those. These would also perform great in the kitchen for handling hot liquids and things like large roasts or turkeys. But you would not want to use these as pot holders for temps above 425°F. 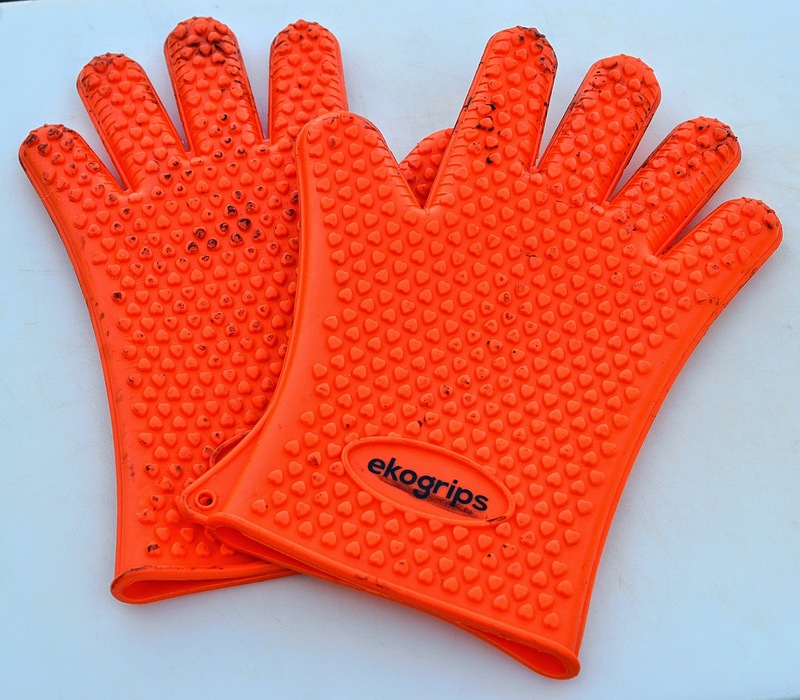 [Standard FTC Disclaimer] I receive no compensation for this post and paid full price for my Ekogrip Silicone BBQ Gloves. I do have an Amazon Affiliate Seller account; however, links in this post are NOT linked to my account and I do not get a percentage of any sales.